There are those who have a special bond with the earth. Our uncle – Wojek – was just such a man: stubborn and suspicious, with eyes like an animal that would size a person up in a glance, he was blessed with the ability to nurture all things green. With no patience to engage in dinner-table discussions about the state of the world or the latest styles for longer than it took to clean his plate, he could spend hours carefully twisting the branch of a bonsai, coaxing seedlings to sprout out of their cotton-wool nests or just turning over the dark, damp earth in preparation for that year’s vegetable garden. He was our source of botanical wisdom – if Wojek said the brown withered plant held sadly in our hands was beyond salvation, we knew there was truly nothing else to be done. More often than not he would just give us the look, take it and in a month’s time have it four times the size, green and thriving in his kitchen window. 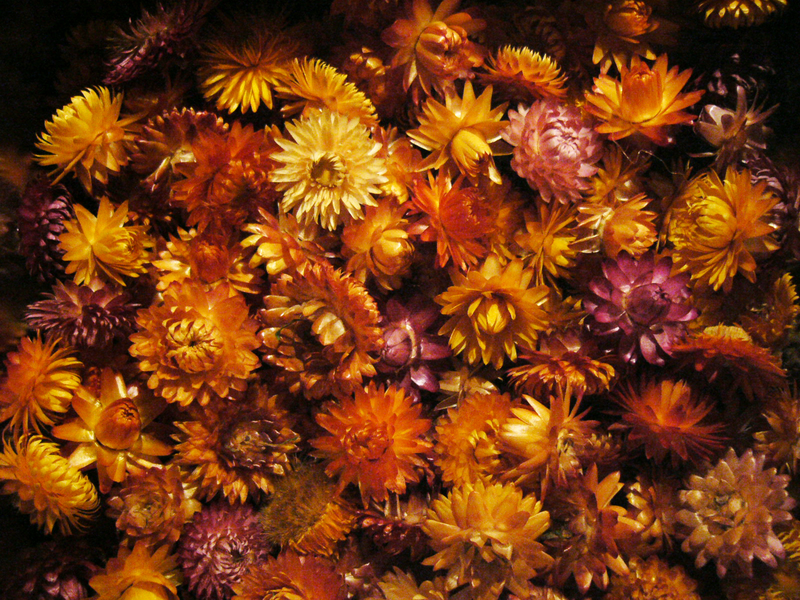 Wojek had come through life like a character in a Russian novel and throughout the years never saw the need or the use of being on the giving end when it came to assorted family holidays but a passing mention about a childhood memory of strawflowers resulted in a bed of blooms as variegated as the colours of a summer’s worth of sunsets. It was just who he was. This fortnight’s Two Cents Tuesday Challenge theme – Gifts – is as much about the temporal as the eternal and last week, Across the Bored queried “What is a gift for you?” -A present, a prize, the look in her eyes, a talent to sing or big shiny ring, the love of a child or something more wild, the quiet of night or just waking up, right…… We would love to see your vision. Well pardon me while I strut around my studio feeling like a groundbreaker! HAHA! In all seriousness with regards to my two cents about gifts, I found that it was far easier to “put to canvas” my thoughts. I have written a few short stories about my experiences and they weren’t nearly as clear. I guess this is part of why I consider myself an artist and not a writer. Do what you feel best – that’s what these challenges are all about!